This was a close call. I almost choked when I saw this and similar buttons being sold by Amazon, since I assumed they were *pro* Joseph Kony. The man in question is probably the worst war criminal in Africa. Kony, the commander of the so-called Lord's Resistance Army (LRA) in northern Uganda, is also a cult leader of sorts. He would make Jim Jones look like a fairly nice guy! 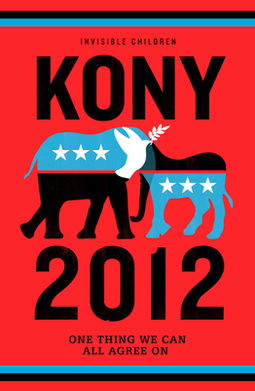 Fortunately, it turned out that "Kony 2012" was a campaign directed against said Kony, sponsored by a group called Invisible Children. That's fairly obvious on this button, where Kony is compared to Bin Laden and Hitler.